We recognize that having work done is not an everyday occurrence for you. It can upset your routine and be unsettling. We do everything possible to minimize your inconvenience. Our goal is to make sure your project goes smoothly according to your expectations. We will communicate with you so that you know when we are coming and what to expect during your project. Let us know what your expectations are and we will make an effort to accommodate you. We are professionals. We have been doing work in the Fairfield Westport area for over 20 years. 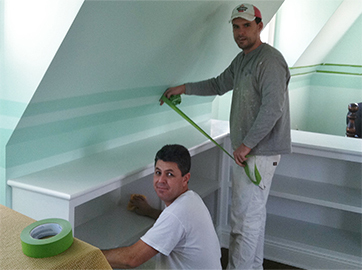 Your interior painting project will be properly staffed to ensure that it is completed quickly and professionally. Furnishings are removed or covered with clean plastic. Floors are covered. We clean up daily. Surfaces are properly prepped before painting. Nail holes are filled, gaps are caulked, wall cracks repaired and or re-taped. Bare wood is primed and stains are sealed. We use only high quality materials. We’ll help you turn your visions into reality. Have a creative idea? We let you know what’s involved so you can decide if it makes sense.